Site Product Service Hierarchy - e-Biller is capable to maintain the site portfolio for the operator to project their services, products on offer. Customer Hierarchy - e-Biller is able to record Multi Layer customer's Billing hierarchy. When operators forecast that a customer or even a group of customers are likely to churn, they will need to address the problem immediately. The ability to move customers on to an alternative plan that is not only attractive to them but also profitable for the operator is of prime importance. The e-Biller reallocation section and plan management, allows operators to rapidly change tariffs and adjust periods (such as off peak, low peak, etc. ), in order to create more appropriate plans (particularly useful for the retention of corporate clients). Usage based charges - These are charges incurred to the subscriber/customer for their usage for a particular billing cycle. Commitment Charges - These are charges incurred when a particular customer fails to retire its MRC (Minimum revenue commitment). With e-Biller, erroneous CDR's (Call Data Record) enter into Usage Correction management process and are transmitted on the web for corrective action. In e-Biller erroneous CDR's are grouped according to the type, to allow single action from the user in order to correct all erroneous CDR's of the same type. e-Biller provides back-out of CDR's from Customer Usages, to allow user to correct the Customer Rating plans, to re-process the Backed out CDR's with new Rating plans. Define multiple contract plans for single customer organization. Define commitment for single charge element or group of charge elements. Define commitments on monthly basis or any multiple of months. Account Level Billing - e-Biller allows operators to assign multiple accounts under same customers. In this level all accounts specific to the customer organization will receive individual invoices. Account with Sub-Account Level Billing - In this level e-Biller allows operator to create multiple accounts having multiple sub-accounts under same customer. In this level invoices can be generated at customer account level or customer sub-account level. Account/Sub-Account having Applications Level Billing - This level is further expansion of previous level where operators are allowed to assign multiple applications under account and sub-account under same customer. In this level invoices can be generated at customer account level or customer sub-account level. Application Level Billing - In this level the setup is same as previous level but invoices are generated at application level for the customer. Level of billing, such as Invoices at Primary customer level, Secondary customer level or Application level. e-Biller Plan management section provides various range of predefined Telco's specific plan to the operator to choose from. In these plans various combination of category items are provided using that operator can choose to bill Customer organization in various ways. Separate ranges of plans are available for each billing level. Another Hot feature of Plan management is to allow operator to create its own billing plan by placing the billing categories at it desired level. The system manages customer account in a similar way that a bank account is managed, i.e. all charges, payments and the account balance are known at any given time. Flexible adjustments schemes are provided with various options to the operator to choose and apply proper credit to the customer organization. The accounts receivable application, deals with all functions related to customer payments and prior bill adjustments. The system offers a process to deal with non-paying customers. e-Biller supports the capability for the operators to generate, approve or delete single or group of Invoices from the web. e-Biller provides the capability for the operators to access bill images over the web which is formatted in the same way as the customer's bill. Bills format are according to the Telco's pre-defined format and it can be assigned to any customer at any time. e-Biller provides the facility for the operators to write account specific or global to all bill messages over the web which is formatted over the customer's bill. 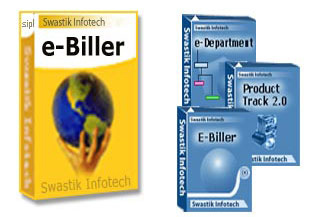 e-Biller provides the facility for the operators to write account specific bill attachments over the web which is formatted over the customer's bill. e-Biller Invoice Management section is equipped with many useful tools for the operators, to provide the ability to answer customer's questions, which is of prime importance. e-Biller provide a separate section for Universal Service fund which helps compensate telephone companies for providing access to services at reasonable and affordable rates throughout the country, including rural, insular and high cost areas, and to public institutions.